If I set out a platter of pork tenderloin on the table, I get turned up noses. But if I add something with color… say pinkish purple… I get a much better response. The tenderloin is moist and flavorful. This is so simple to make, the presentation is beautiful you could serve it to guests at any occasion. With such minimal preparation, and with less mess, this leaves more time for entertaining! When berries are in season, we almost can't get enough of them. Blackberries are big and bursting with flavor. When you add some blackberry sauce to this dish it takes it to a whole other level. This is a meal the entire family gave a 5-star rating on. 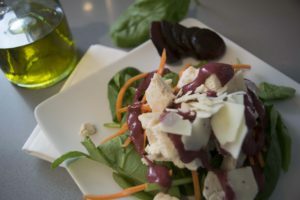 Save the left-over sauce and it is wonderful on a spinach salad. Rub the pork tenderloins with the seasoning rub. Place in a roasting pan or cover a baking sheet with foil and place tenderloin on the foil. Cook until the pork is no longer pink in the center, about 45 -55 minutes. An instant-read thermometer inserted into the center should read 145 degrees. While the tenderloin is roasting, prepare the blackberry sauce. 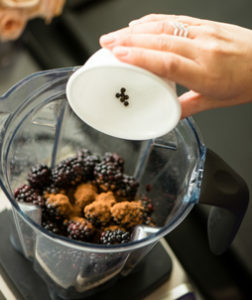 Add the apple cider vinegar, blackberries, cinnamon, Chinese 5-spice (optional), and black peppercorns into a blender. Blend for 1-2 minutes. Slowly add in the olive oil through the top opening in the blender. Blend for about 1-2 minutes until the sauce is smooth. Once the tenderloin is done, remove roast to a platter and let rest for 5 minutes. Slice into about 1/2-inch slices. Drizzle the sauce over the top for presentation. 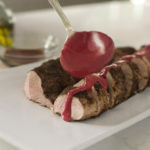 The kids loves the sauce that went with this tenderloin. I find that they like food when its presentation is just as good as the food. The sauce is sweet and savory so even the pickiest eater will love to dip into this yummy, fruity sauce. Frozen blackberries can also be used in place of the fresh. When using frozen, thaw completely and reserve the juices to add to the blender.